It’s a fantasy that has now excited the best part of three generations. The notion that we could visit a place where Dinosaurs wander freely. From the original Jurassic Park film in 1993, to this years Jurassic World: Fallen Kingdom, the fiction has continued to grow. And now, with Jurassic World Evolution we have the opportunity to play with that fiction. Take a step back a couple of years and we saw the resurgence of the Theme Park genre. Atari released Rollercoaster Tycoon World. A long-awaited sequel to the Rollercoaster Tycoon games. But this one wasn’t developed by Frontier. No, Frontier had their own game that they sneaked out at the same time. And I doubt you will find many people arguing that Rollercoaster Tycoon World was better than Planet Coaster. And so, Frontier have managed to capitalise on the success of Planet Coaster. 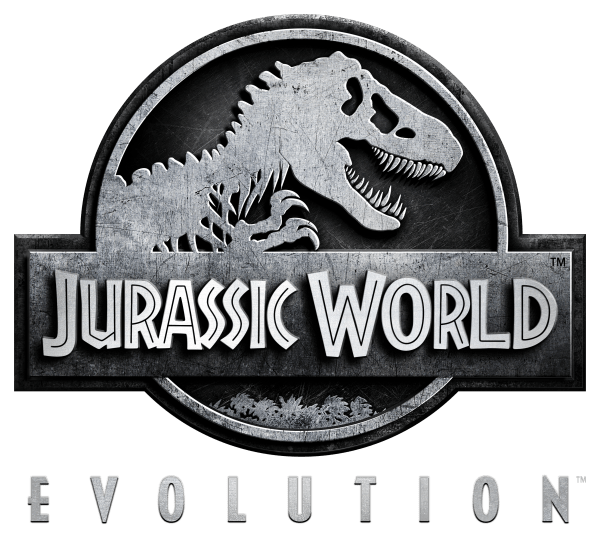 Combined with a hot piece of IP in the Jurassic Park license, spawns Jurassic World Evolution. A theme park management game… with Dinosaurs! 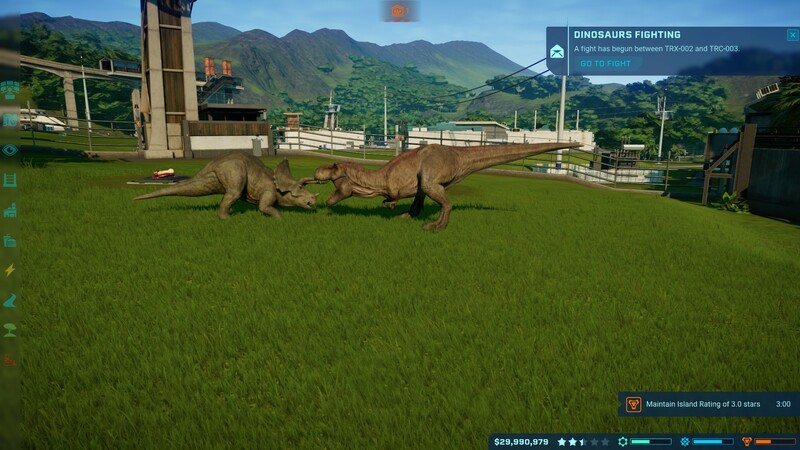 The Dinosaurs are the key to Jurassic World Evolution. You need to send out dig teams to unveil fossils. From these you can extract DNA, and once you have built up a 50% genome, you can start to incubate dinosaurs of that breed for your park. And this is the games grind mechanic. 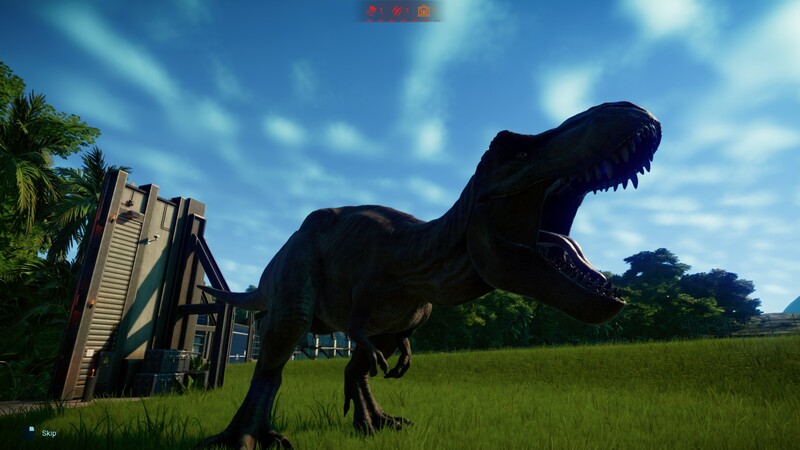 Some of the dig sites and fossils are locked behind progression levels, so you have to wait and grind a while before you can think about rearing a T-Rex in your park. But when you do and you finally get to release the T-Rex from your Hammond Creation Centre, you won’t be disappointed. Frontier have done a fantastic job of modelling each dinosaur in the game. They also managed to get a hold of a bunch of the original audio from the films to enhance and repurpose for the game. And it all just adds to the fangasm. And while 48 dinosaur species sounds a lot (5 of which are only in the Deluxe Edition), you will fairly quickly run through them all. Jurassic World Evolution features six main islands to play the campaign on. A seventh island is open as a Sandbox mode. 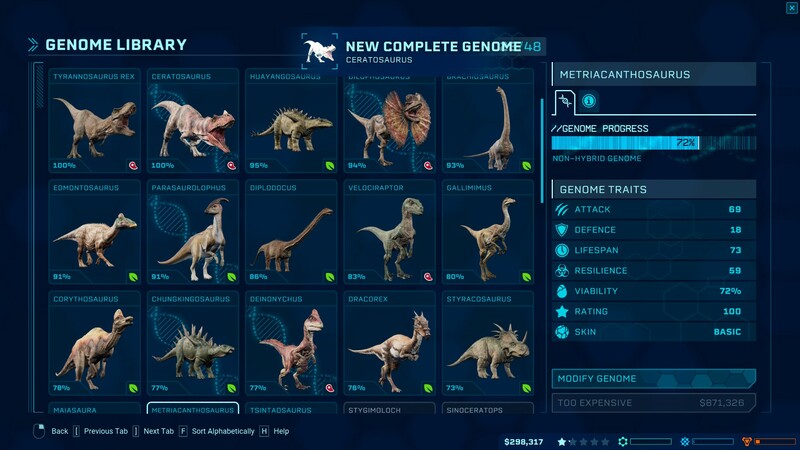 But you still need to have researched all the dinosaurs to have access to them in the sandbox mode too. Cash balance and island ratings are unique to each island, but you otherwise share research, tech and knowledge between each island. And while each island does present its own unique obstacles, the main hurdle will be finding space to put down all the buildings and facilities you need. 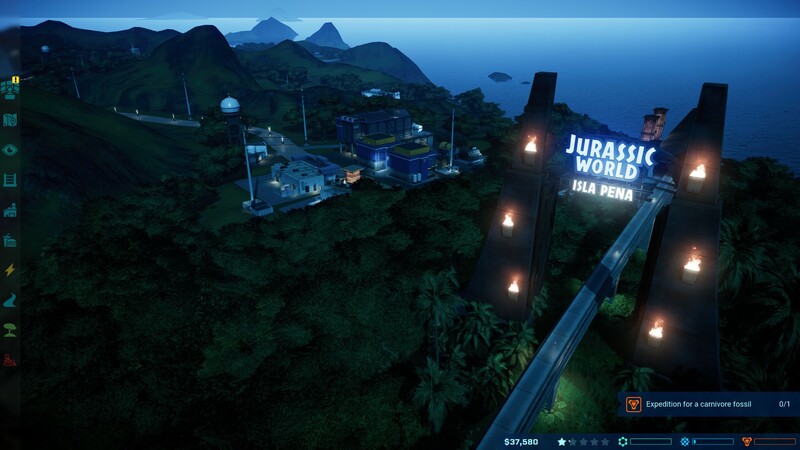 Those looking for an in-depth park management simulation will find Jurassic World Evolution a bit on the thin side. Visitors needs are all captured into a single star rating interface. You can’t, for example, click on a visitor and find out what their specific needs are. Nor do you need to worry about micro-construction tasks such as benches, trash cans or toilets. Dinosaurs do have their own needs and requirements though. Their health and wellbeing are your number one priority, including treating the various diseases they can catch. Fail to keep your dinosaurs well looked after and you will have problems. An agitated dinosaur will attempt to break loose. Then you’ll have even bigger problems on your hands. Managing disasters takes a much bigger precedence than managing your patrons. 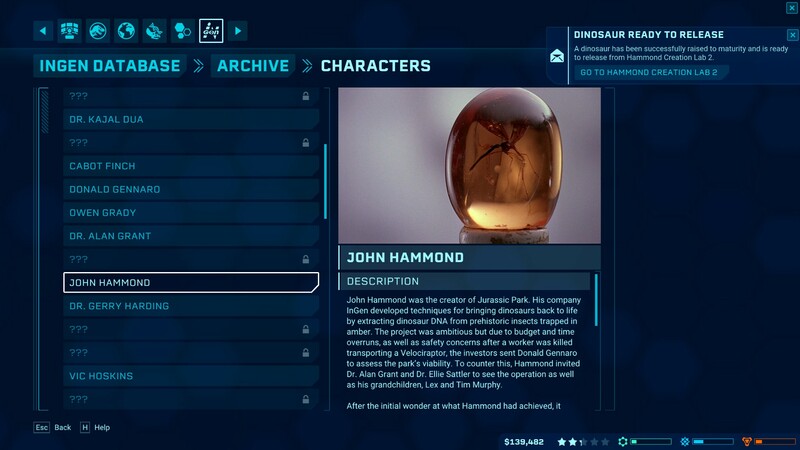 The final ode to the Jurassic World lore is the in-game Ingen Database. As you unlock and research various things in the game, entries appear in this database. These range from the Dinosaurs, Dig sites and Palaeontology records, to locations and characters from the films. And while we are on the topic of characters from the film, Jurassic World Evolution also includes a wealth of voice overs from Dr. Ian Malcolm himself, Jeff Goldblum. However, the quality of these are somewhat lacking. Giving the impression that Jeff Goldblum was perhaps reading the script for the first time. As far as theme park simulators go, Jurassic World is quite disappointing as it lacks the real depth that players will be looking for. But as far as nostalgia goes, Jurassic World Evolution is right on the money with fantastic recreations of these extinct creatures.